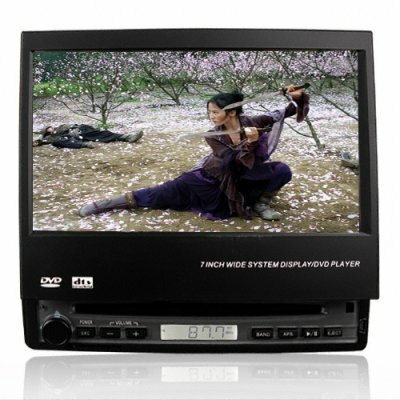 Successfully Added Widescreen Car DVD Player with 7 Inch Touchscreen + Bluetooth to your Shopping Cart. Widescreen Car DVD player with 7 inch touchscreen and Bluetooth for entertainment, convenience and safety while on the road. This single DIN (1-DIN = 50mm tall) multi-function motorized Car DVD player with a 7 inch TFT LCD touchscreen display and embedded Bluetooth technology makes a great car upgrade for anyone wanting to do some DIY work on their car during the next long weekend. By upgrading a single 50mm slot in your car you can replace your old car stereo with a sound and multimedia powerhouse. Do you still enjoying playing your CD's while you drive to work? Need a user-friendly Bluetooth handsfree device to use while you drive on your sales trips (using your car stereo speakers - great for those of us who need to really hear what that quiet talker is saying)? Or just want to keep the kids busy with their favorite DVD movie while you are driving along the busy road trip? No matter what your needs, this unit can cover the basics and do it in style. With all the basics covered, including MOSFET 50W x 4 sound output, this is a Car DVD player makes a sweet vehicle upgrade and comes to you at a direct to you wholesale price.